Kim Kardashian West's Official KIMOJI app gives you access to 500+ emoji, stickers, and GIFs! Works in all messaging applications where the copying and pasting of images and GIFs is supported. Also includes integrated QWERTY keyboard. New designs are always being added, so install now and start building your collection! 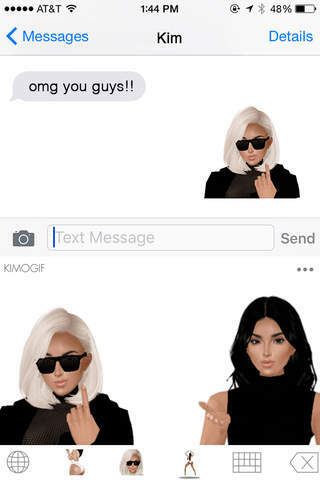 KIMOJI is compatible with iPhone 5S / iOS 9 and above. Please contact KIMOJISupport@kardashianjennerdigital.com if you are experiencing any issues. I use these frequently so I’m going to write an in-depth review. I wrote a review on December 10th how the stickers were completely unusable, it was basically a dead app. They fixed that issue and they work fully 100%. (1/6/18). My only complaints are some of the sticker GIFs are so small people can’t see them. Another thing is some stickers have a white boarder around them and you can’t drag/drop them onto a iMessage because the white border covers up the words. Other than that. Great update. Lol this wasn’t what I expected. Not even emojis just pictures. If you like Kim just watch the show or follow on Instagram. This app is a waste of $2.99. I was so happy with this app when I first got it. The app ran so smooth and my phone never got stuck, lately I am never able to use the KIMOJIs because they will. It load. I have sent several emails to the support team and I never hear anything back from them. So I will honestly say I am a disappointed with this money gone to waste for something you can never open and use. ***LATEST UPDATE: crashes at times, but I find myself using these more and more even if it takes an additional 20 seconds to load, crash, scroll through, copy, paste, AND FINALLY send ONE kimoji, lol... what can I say? They're hysterical...I really like them. **** ***FYI: you can ONLY use them in basic phone messaging unless you want them to be blown up the size of Dallas!!! & you must copy and paste them into the message- So, are they funny/cute/amusing to text with? Yes. BUT they're sort of a pain to use. I'm confused why they didn't work out ALL the kinks before debuting the app. (Surely it had to do with financial gain! Ha!!) Nonetheless, I'm going to continue to keep this app and as with most of the Kardashian/Jenner apps.... I'll continue to buy new ones and continue to use the ones I already have purchased! Ive followed the steps from the general and keyboard to allow the kimoji app. Done. And I made sure my Kimoji app is using cellular data like all other apps I have. Still have this issue. I have to uninstall and then reinstall for it to send ONE sticker before it doesn’t display them again. I have an 8Plus and I just got it yesterday so I doubt it’s my phone. I also did the latest update to it. I can’t see the kimoji app from the bottom of the “favorites “ bar. I have to go into the app first and then pick the one I wanna send. Kinda frustrating. How do I get a refund??!! The latest update is SO slow, it takes forever for all of the Kimojis to load. By the time they load I don't even want to send them anymore! This used to be one of my favorite apps, but it has somehow gone from great to terrible. Shouldn't it be getting BETTER with each update?? And once again there are more missing Kimojis. Choice to change skin tone? Gone. All of the extra holiday packs? Gone. Eating the hot dog gif? Gone. Total BS. Just a heads up basically this app cannot be used like emojis, their almost all stickers. Nevertheless, it doesn't work on Snapchat or WhatsApp. Every time you want to use any of the stickers, gifs or the so call emojis the whole entries App has to reload. It takes a while to load. Really disappointed, just wasted $2.99 on a App which wasn't worth my money. Hope this helps!